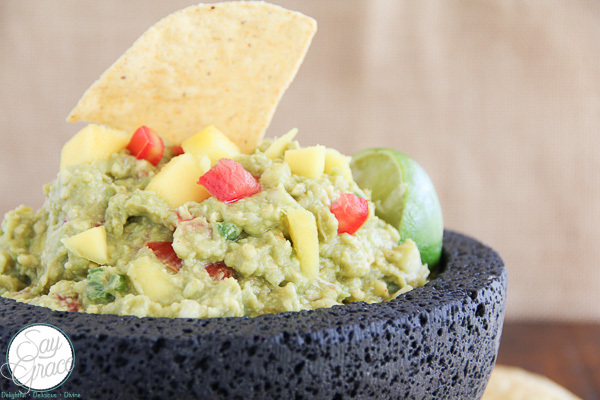 A traditional guacamole meets a whole lotta flava! 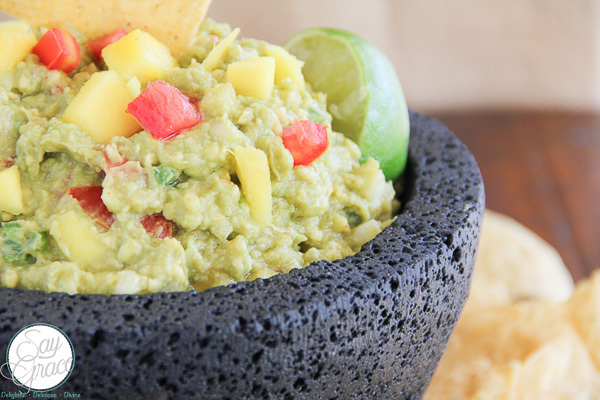 “I HATE GUACAMOLE” said no one after trying this recipe! 🙂 Well, I must say that I used to have a very strong dislike for the authentic, chunky green dip. Every time I would sample it, I found it to be just bland and lacking flavor. BORING!! Even the hubby would say that it tastes like something out of a baby food jar so needless to say, he never liked it either. When I stumbled across this recipe by Alton Brown, I noticed that it had a couple ingredients that I always use in my Tex-Mex dishes…cumin and cayenne pepper! Yep, these additions make this dip everything to me! I love it and now I just can’t get enough. I also wanted to create a sweet balance to compliment the spiciness of the cayenne so I added mango. OMG! This is where it’s at! Some may say that it’s not authentic because of all these additions so I call it the Tex-Mex version or simply, Tasty Mango Guacamole! If you’re not a fan of guacamole, you will quickly become one after trying this recipe, repeating I LOVE IT, I LOVE IT, I LOVE IT in between each and every scoop! It’s just that good! Take 3 Haas avocados (make sure they are tender to the pressure of your thumb…this means they’re ready 🙂 ) , cut them in half and remove the pit. Peel the skin and toss the avocado flesh into a bowl. Squeeze the juice from 1 lime all over the avocadoes and toss to coat. Pour off the excess juice and reserve it for later. Add 1/2 tsp. of kosher salt, 1/2 tsp. of cumin, 1/2 tsp. 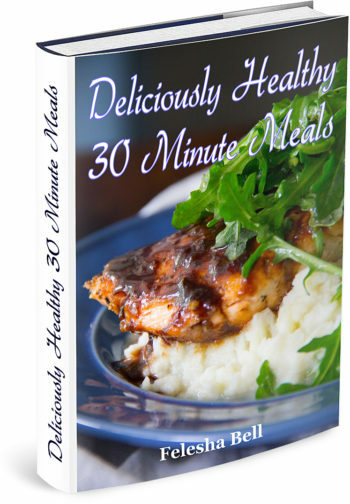 of cayenne pepper and mash everything with a fork to your desired consistency. Do you smell that? OMG! That’s pure goodness in the making! Dice up half of a medium sweet onion, seed, dice and mince half of a jalapeno, dice and seed 2 roma tomatoes, peel and cut up 1/2 of a mango, mince 1 large clove of garlic, and chop up 1 T. of fresh cilantro. The cilantro is totally optional in my book as hubby can’t stand it. Thinks it’s waxy. Your choice! Fold everything together and add the reserved lime juice back in. Cover with plastic wrap and be sure to let everything sit out at room temperature for at least an hour to allow the flavors to meld. Two hours is optimal. Tip: Never serve guacamole cold. It’s just not as delicious in my opinion! Now repeat after me, I LOVE THIS GUACAMOLE! 🙂 After all, it’s always better to walk in love. Ephesians 5:1-2. Say Grace and enjoy! Toss avocado flesh into a bowl and squeeze lime juice and toss to coat. Pour off the excess juice and reserve it for later. Add kosher salt, cumin, cayenne pepper and mash everything with a fork to your desired consistency. Fold in onion, jalapeno, tomatoes, mango, garlic, and cilantro if using. Add the reserved lime juice back in. Adjust salt and cumin, if necessary. Cover with plastic wrap and allow the dip to sit out at room temperature for at least an hour to allow the flavors to meld. Tip: Never serve guacamole cold. Say Grace and enjoy! Mango and avocado are SOOO good together, I usually combine them in a Thai type salad, but this guac sounds just like my kind of dip! We love guacamole and now this makes a great change for our usual ones! Oooh, I love fruit in guacamole! Such a great combo! This looks amazing! I know right!! Thanks so much Jenn!! YUMM this sounds like an amazing twist on a classic guacamole! I have to try it! I love that you added cumin. I never thought to put cumin in guacamole, but it’s probably my all-time favorite spice. I’m going to try this for the Super Bowl! this looks great…i love the addition of mango! Thanks Dawn! I love the sweetness that it adds to the dip! I absolutely LOVE Alton Brown’s Guacamole!! The added spice makes such a difference! But it sounds even MORE amazing with Mango! Love those two together! 🙂 Can’t wait to try this! I know right, Dini?!?! The sweet mango pairs so nicely with the cumin! Thanks for stopping by! !